(June, 2014) I've been living in Raleigh, NC, USA since around 1994; I'm originally from the Boston, MA area. I was born in 1959, and my parents noticed that I took a liking to a little toy-like "organ" they bought when I was about 7. This little "organ" had 3 octaves of keys, and chord-buttons for the left hand! 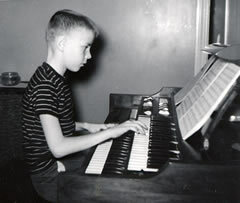 From there, I took some lessons on a Lowrey Holiday Deluxe organ (1960s-era). The picture here shows me as a kid playing the Lowrey. I started playing in "makeshift" bands in high school, doing occasional gigs with friends etc. Back then, we mostly played music from that era (1960s and 1970s). Due to the organ lessons, I also learned a lot of other styles, such as the music of the earlier part of the 20th century (Big-Band, swing, ballroom styles, etc.) and a bit of classical. Later, I played in a bunch of "classic-rock-focused" bands in my college, doing all kind of gigs for parties, banquets, wedding receptions and the like. Most of these were 5- or 6-piece bands. In New England where I was from, this kind of band was called a "GB band" ("GB", I think, stood for "General Business"). Around college age and beyond, I took up more and more interest in more varieties of music styles, from classical to jazz to adding to the "classic rock" tunes I played. I also got more into R&B, blues and "Beach" music. 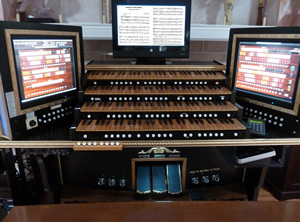 I always had a love for pipe organs – both theatre and classical/liturgical types of pipe organs. I probably discovered "Arranger" keyboard in the 1980s or so, buying my first Technics keyboard – the KN-800. Technics became the brand I liked, and I bought about "every-other" model, up to the KN-7000 (I tended to skip one new model and wait for the 2nd/next new model before buying a new keyboard). On the side, I was still playing theatre and classical organs from time to time, and I usually had an organ of some kind in the house in addition to my keyboard rig. When Technics stopped making keyboards, I jumped over to the Tyros line purchasing a Tyros3 after selling my KN-7000. 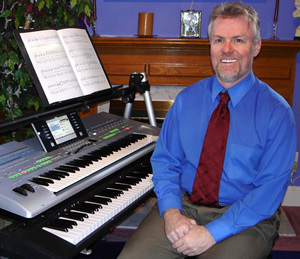 As of 2014, I use the Tyros5 as the main part of my rig. I still play with a band, which plays as a 5-piece group as well as some members and I play gigs as a duo or trio. 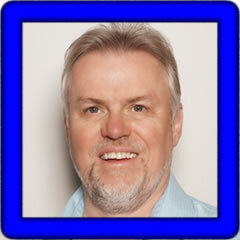 About half of my gigs are solo, which I play on the arranger keyboard using styles etc. For the duo and trio, I also use the styles, but let the other players play the acoustic guitar and electric guitar parts live. For the full band, I'm more a "pure keyboard" player, since we have live drums and bass! I still enjoy a really wide variety of music from classical to rock, and a lot in between. I like to find unusual "novelty" songs too, that aren't heard or played as often as the more popular tunes. We have a "custom" built (by a friend and I) Hauptwerk-based organ at home (pictured here), so I still play theatre and classical organ music, in addition to the music I play on my keyboard rig. I love to play, and hope that I can do it until "the day I die" -- if the mind and body are willing! Although I do a few gigs a month, my favorite thing is just to gather some music-minded friends (players, singers, and those that just enjoy listening to impromptu live music) together and have a jam session, or as I call it, a "music night", at my house. Some of my other interests are video-making (shooting, editing), photography, tennis, winter sports, science fiction (movies, books) and home theatres. The Tyros3 MP3 songs below are demos I recorded for my duo, "Backfence". Most of the music heard is me on the Tyros3, played live (no overdubbing). There is some acoustic guitar played by Tom Devito, who also sings. I sing 'backup' harmony on a few tunes, but he does most of the singing. Everything was recorded "live", that is, keyboards, vocals, guitar, all at the same time (not done via 'multi-tracking'). (April, 2017) The MP3 songs I am adding this month were recorded by me "solo" on the Tyros5. Most have me playing the song "live", then I added an extra pass or layer to add one extra sound (i.e. one pass of an extra 'track' added). I recorded all of these in late 2016. Jim's songs are arranged alphabetically by keyboard. Click on the song title to listen to and/or download the song. Order any PSR Tutorial Resource set or make a donation to become a "Supporting Member" for life! (c) 2015 PSRTutorial.com.